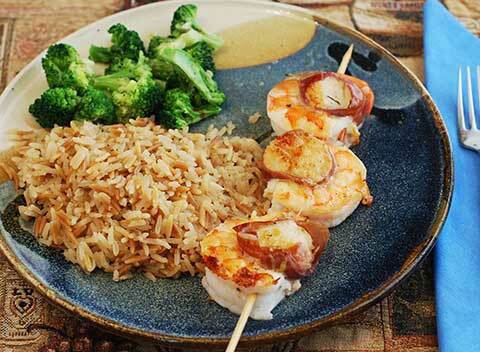 These seafood kebabs look elegant and special, but they’re so easy to make you could prepare them for any occasion. As an alternative, you could assemble them individually and secure each one together with a toothpick. It’s your choice. Combine the Lemon Herb Butter ingredients in a small pan. Set aside. Cut a slice of prosciutto lengthwise into four narrow strips. Wrap one strip around a scallop, then press the scallop into the curve of a shrimp (with the overlap of the prosciutto against the shrimp). Either pierce the scallop and shrimp together with a toothpick or pierce with a skewer, arranging three to a single skewer.